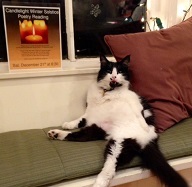 The Great Catsby joined Gallery Bookshop in the fall of 2012. He was seen wandering on the streets of a neighboring town, darting in and out of businesses. 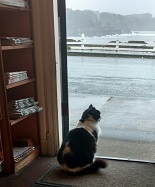 One day, he found a car with an open window and hitchhiked (without the driver's knowledge) to the village of Mendocino. 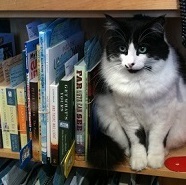 There, he was picked up by a friend of the bookshop and offered the job of bookstore cat. 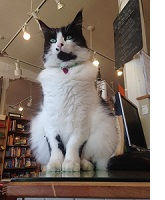 His duties include sleeping atop card racks, greeting dogs with a glare and a flick of his tail, and occasionally allowing customers to scratch him behind the ears. He can usually be found sitting in the window, warming himself in a patch of sunlight. Animal lovers will laugh out loud at the quirkiness of their feline friends with these insightful and curious poems from the singular minds of funny cats. In this hilarious book of tongue-in-cheek poetry, the author of the internationally syndicated comic strip Sally Forth helps cats unlock their creative potential and explain their odd behavior to ignorant humans. “A soulful, humane, and sparklingly funny novel. A New York Times bestseller, My Struggle: Book 1 introduces American readers to the audacious, addictive, and profoundly surprising international literary sensation that is the provocative and brilliant six-volume autobiographical novel by Karl Ove Knausgaard. Cat lovers can forget about eating solo, and cats no more have to look longingly at the meals their caretakers have prepared in hope of getting a bite. Internet sensation Grumpy Cat's epic feline frown has inspired legions of devoted fans. Celebrating the grouch in everyone, the Grumpy Cat book teaches the fine art of grumpiness and includes enough bad attitude to cast a dark cloud over the whole world.